Interest is the compensation paid by the borrower to the lender for the use of money as a percent, or an amount. The concept of interest is the backbone behind most financial instruments in the world. While interest is earned, it is different from profit in that it is received by a lender as opposed to the owner of an asset or investment, though interest can be part of profit on an investment. There are two distinct methods of accumulating interest, categorized into simple interest or compound interest. This interest is added to the principal, and the sum becomes Derek's required repayment to the bank. Derek owes the bank $110 a year later, $100 for the principal and $10 as interest. Let's assume that Derek wanted to borrow $100 for two years instead of one, and the bank calculates interest annually. He would simply be charged the interest rate twice, once at the end of each year. Derek owes the bank $120 two years later, $100 for the principal and $20 as interest. However, simple interest is very seldom used in the real world. Even when people use the everyday word 'interest', they are usually referring to interest that compounds. Compounding interest requires more than one period, so let's go back to the example of Derek borrowing $100 from the bank for two years at a 10% interest rate. For the first year, we calculate interest as usual. This interest is added to the principal, and the sum becomes Derek's required repayment to the bank for that present time. When the loan ends, the bank collects $121 from Derek instead of $120 if it were calculated using simple interest instead. This is because interest is also earned on interest. The more frequently interest is compounded within a time period, the higher the interest will be earned on an original principal. The following is a graph from Wikipedia showing just that, a $1,000 investment at various compounding frequencies earning 20% interest. There is little difference during the beginning between all frequencies, but over time they slowly start to diverge. This is the power of compound interest everyone likes to talk about, illustrated in a concise graph. 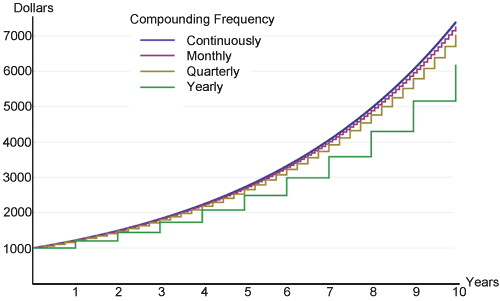 Continuous compound will always have the highest return, due to its use of the mathematical limit of the frequency of compounding that can occur within a specified time period. Anyone who wants to estimate compound interest in their head may find the rule of 72 very useful. Not for exact calculations as given by financial calculators, but to get ideas for ballpark figures. It states that in order to find the number of years (n) required to double a certain amount of money with any interest rate, simply divide 72 by that same rate. Example: How long would it take to double $1,000 with an 8% interest rate? It will take 9 years for the $1,000 to become $2,000 at 8% interest. This formula works best for interest rates between 6 and 10%, but it should also work reasonably well for anything below 20%. The interest rate of a loan or savings can be "fixed" or "floating". Floating rate loans or savings are normally based on some reference rate, such as the U.S. Federal Reserve (Fed) funds rate or the LIBOR (London Interbank Offered Rate). Normally, the loan rate is a little higher and the savings rate is a little lower than the reference rate. The difference goes to the profit of the bank. Both the Fed rate and LIBOR are short-term inter-bank interest rates, but the Fed rate is the main tool that the Federal Reserve uses to influence the supply of money in the U.S. economy. LIBOR is a commercial rate calculated from prevailing interest rates between highly credit-worthy institutions. Our Interest Calculator deals with fixed interest rates only. An important distinction to make regarding contributions are whether they occur at the beginning or end of compounding periods. Periodic payments that occur at the end have one less interest period total per contribution. This is tax-free. However, if Derek has a marginal tax rate of 25%, he will end up with $239.78 only because the tax rate of 25% applies to each compounding period. Inflation is defined as an increase in the general level of prices, where a fixed amount of money will relatively afford less. The average inflation rate in the United States in the past 100 years has hovered around 3%. As a tool of comparison, the average annual return rate of the S&P 500 (Standard & Poor's) index in the United States is around 10%. Please refer to our Inflation Calculator for more detailed information about inflation. Leave the inflation rate at 0 for quick, generalized results. But for real and accurate numbers, it is possible to input figures in order to account for inflation. Tax and inflation combined makes it hard to grow the real value of money. For example, in the United States, the middle class has a marginal tax rate of 25% and the average inflation rate is 3%. To maintain the value of the money, a stable interest rate or investment return rate of 4% or above needs to be earned, and this is not easy to achieve.